Hypnosis induces a suggestible state of the mind, by stilling its other states, which rely on control impulses from its emotional, as well as its rational regions. The strategies and objectives of day to day human behaviors are determined by these messages, triggered by either emotions from the limbic system or by signals from the prefrontal regions of the brain. Hypnotic induction stills these controls and enables the system to accept verbal suggestions from the hypnotherapist. By stilling many of its inherited and acquired inhibitions, hypnosis makes a wider range of control options available to the system. Hypnotic suggestions access the normally hidden capabilities of the mind to retrieve deeper memories, to experience nonexistent sensations and to control motor systems in unique ways. Hypnotism has been used in fields including forensics, sports, education, physical therapy and rehabilitation. While hypnotic sleep may be induced through eye fixation, suggestion is its main rule. Susceptibility to hypnosis varies widely in the population. While the nonstate theory suggests that hypnosis is merely another rational process of the mind, it is a distinct state of mind, with exceptional capabilities. Actions under hypnosis are similar to actions triggered by emotions. Combinatorial pattern recognition enables the mind to convert ideas into actions. The intuitive inhibition process allocates different capabilities during different states of mind, including control of the mind through hypnotic suggestions, conscious actions and emotional outbursts. The placebo effect does not fully explain the unique capabilities of the mind demonstrated during hypnosis. Hypnotism has been used in forensics, sports, education, physical therapy and rehabilitation. Scientists have used hypnosis to create temporary hallucinations, compulsions, certain types of memory loss, false memories, and delusions in the laboratory. Hypnotherapy is the use of hypnosis in psychotherapy by licensed physicians, psychologists, and others. Physicians and psychiatrists may use hypnosis to treat depression, anxiety, eating disorders, sleep disorders, compulsive gaming, and post traumatic stress. Certified hypnotherapists treat smoking and weight management. Hypnosis has been used by artists for creative purposes. Stage hypnosis can persuade people to perform unusual feats in public. Sports personalities have been known to use hypnosis to improve performance. Dave Elman introduced a procedure for inducing hypnosis for use by medical professionals. His students routinely obtained states of hypnosis adequate for medical and surgical procedures in under three minutes. The first heart operation using hypnosis instead of anesthesia (because of severe patient problems) was performed by Elman's students under his guidance. Before inducing hypnosis, the procedure for generating imaginative experiences through suggestion is introduced to a subject. Hypnotic techniques generally call for a reclining posture, muscular relaxation, and optical fixation followed by eye closure. Both Indian and Persian history records the achievement of trance like states by maintaining a steady fixed gaze at the tip of one's own nose. Optical fixation closes down the REM access to memories recorded through the hypothalamus. Closure of eyes shuts down potentially disturbing visual activity. The supine posture stills the numerous control impulses required to keep the body in balance. The suggestive power of the therapist relaxes the muscles of the subject stilling more autonomous controls. According to Hippolyte Bernheim, while hypnotic sleep may be induced, it was suggestion, which ultimately ruled hypnotism. In the final stage of induction, the therapist suggests changes in subjective experience, alterations in perception, sensation, emotion, thought or behavior by the subject. Hypnosis is inferred to be induced if the subject responds to such hypnotic suggestions. The Stanford Hypnotic Susceptibility Scale (SHSS), is a research tool, which measures human susceptibility to hypnotism. Deirdre Barrett identified two distinct types of highly susceptible subjects, calling them “fantasizers” and “dissociaters.” Fantasizers are able to focus on their imaginative thoughts, blocking out real world stimuli. They spend much time daydreaming, report imaginary companions as a child and grew up with parents who encouraged imaginary play. Dissociaters often have a history of childhood abuse or other trauma and learned to escape into numbness and forget unpleasant events. Rather than daydream, their minds go blank. Both fantasizers and dissociaters have greater ability to inhibit intruding sensory inputs, granting their minds greater access to hypnotic suggestions. The Stanford, Harvard, HIP, and most other susceptibility scales categorize a person's susceptibility as 'high', 'medium', or 'low'. Approximately 80% of the population are medium, 10% are high and 10% are low. Susceptibility Scores are highly stable over a person’s lifetime. Robert White suggested that behavior under hypnosis was merely another rational pattern of behavior by the mind. It was “meaningful, goal-directed striving, its most general goal being to behave like a hypnotized person as this is continuously defined by the operator and understood by the client.” It was suggested that most of the effects of hypnosis could also be achieved without hypnotic induction. It was argued that hypnosis does not create a specific sleep-like neurological state comparable to animal hibernation or yogic meditation. This website suggests that hypnosis creates a unique state of mind, where the highest control levels of the mind obey the suggestions of the hypnotist, subject to specific limitations. The controls of the mind switch between different states, different levels of consciousness, as myriad intelligences, accumulated by nature over millions of years, balance the needs of various sensing, feedback and control systems of the mind. The mind switches its states, its levels of consciousness, based on specific emotional inputs from the limbic system or from rational inputs from the prefrontal regions. Emotional states such as fear, sadness, disgust, contempt, curiosity, surprise, love, pleasure, embarrassment, guilt, or shame transform entire behaviors, objectives and perceptions of the mind. These processes work ceaselessly, around the clock, shifting consciousness between various states. An animal does not stop undecided between its urge to eat and its need to drink any more than an automated production line. A machine, which sorts and deposits components into different bins is designed to act on its choices as long as it is switched on. The mind switches between many states of consciousness. The current emotional state may over ride even conscious choices. Your conscious decision to raise your arm will be over ruled by your sense of propriety if you are standing in an elevator with other passengers. The emotional state takes control. Hypnotic suggestions still both emotional and conscious controls. The mind switches to a new state, where instructions of the therapist take control. Those suggestions command thoughts and behaviors as well as subjective experiences of perception, sensations, and emotions. Suggestions by the therapist produce motor effects similar to those caused by emotions. A suggestion by the therapist that a person's body has become rigid parallels a sudden and fearful realization by him that he is perched on a plank one hundred feet above ground. On recognition of the danger of falling, the limbic system triggers fear signals, which reach the motor systems causing the person to freeze. The recognition of myriad such events in the life of a person trigger such emotions. Each emotional signal sets off appropriate behaviors and facial expressions. Verbal suggestions also produce motor responses. Both the suggestion by the therapist and the fear emotion trigger motor controls, which cause the person to freeze. Hypnotic suggestions are similar to emotions, recognized by the mind as instructions to modify behavior. The motor system recognizes and responds to both ideas and to emotions. Hypnotic regression makes a patient's mind search through memories of trillions of events to locate the target event, which exactly suits the commands of the therapist. As on date, there are no widely accepted neural or computational models to explain such access to childhood memories through hypnosis. The difficulty of explaining this phenomenon can be compared to the mysterious functions of the mirror neuron network. Vernon Mountcastle first discovered that specific neurons in the premotor area of the cortex fire during motor control activities. Researchers, experimenting with monkeys, identified the neurons, which fire when an animal reaches for a peanut, pulls a lever, or pushes a door. Iaccomo Rizzolati discovered that neurons in the same regions mirror this activity, when the animal watches another monkey perform similar actions. Neural regions can convert visual data into motor data. A monkey does not have neural circuits linking it to the motor systems of another animal. Yet, its visual recognition of another animal's activity triggers the precise internal motor circuits required to carry out the same action. The mirror network translates the observed behaviors into the observer's own subconscious experience. 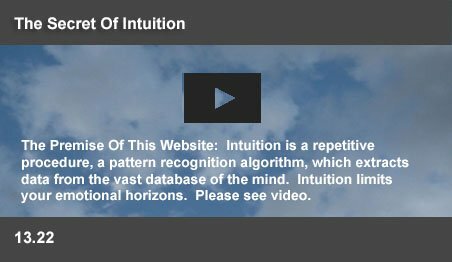 Combinatorial pattern recognition as suggested in this website can process a virtually infinite storage capacity within the mind. The suggested intuitive logic can enable instant evaluation of vast volumes of data through an eliminative recognition process. Combinatorial logic can explain the power of hypnotic regression as well as puzzling mirror neuron functions. While a hypnotic suggestion to feel cold is accepted by the system, a conscious effort to feel cold fails to work. 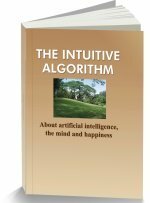 The algorithmic process of intuition can explain such differences in capabilities of the various states of the mind. Intuition focuses on a purpose by inhibiting access to the non focus sources of the immense wisdom of the mind. When an animal chooses to drink water, its urge to chew grass is eliminated. The system functions by inhibiting access to unrelated data. The mind switches states of consciousness between control instructions from hypnotic suggestions, those from the common sense of the prefrontal regions, or the those from emotional drives of fear, anger, or love. Inherited, or acquired codes determine the capabilities available to the controlling intelligence. Certain capabilities are inhibited to each state of mind through inherited, or acquired codes. Your will (prefrontal common sense) is limited by such inhibitions in the intuitive process. A student cannot sit and study, if the system does not think it is WORTHWHILE. Rude remarks are inhibited in an elevator, because they are not APPROPRIATE. Motor systems freeze before an intention to leap off a cliff, because the action is not SAFE. Efforts to learn Mandarin fail, because the mind thinks it is not PRACTICAL. Conscious controls are limited to the WASP range of activities. So also, hypnosis reaches a command center of the mind, which has a broader range of permitted capabilities than those available to the conscious mind. Hypnotic suggestion can make the body feel hot, or cold. But such instructions are intuitively inhibited for the application through conscious control. Neither can a person be hypnotized, if he is opposed to it. A hypnotized subject will not follow any instruction, which is against his will. The limitations and the capabilities of hypnosis are decided by the inherited and acquired combinatorial codes of the mind. How Does Hypnosis Work? -A Placebo Effect? Irving Kirsch called hypnosis a "nondeceptive placebo," a method that openly makes use of suggestion to amplify its effects. The placebo effect can be produced by inert tablets, by sham surgery, or by false information. It is a simulated or otherwise medically ineffectual treatment for a disease or other medical condition intended to deceive the recipient, which delivers a perceived or actual improvement in a medical condition. The placebo effect is an improvement in health, which can directly or indirectly be influenced by the mind. Hypnosis is a process, where the subconscious mind accepts suggestions as commands to put one to sleep, to feel pain, or to make muscles rigid. Hypnotic suggestion have greater capabilities than those available to the normal command structure of the mind. The term “placebo effect” belittles the unexplored capabilities of the mind uncovered by hypnosis.